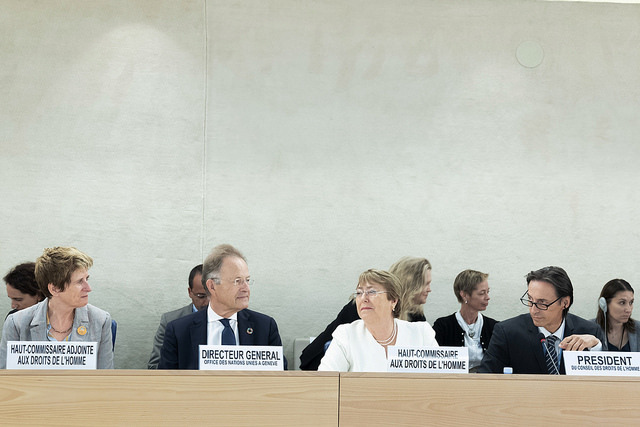 The new UN High Commissioner for Human Rights, Michelle Bachelet, marked the start of her tenure on 10th September with an inaugural address to the Human Rights Council (at the start of its 39th session). As with all inaugural speeches by new High Commissioners, the statement was closely watched by States, NGOs and the media for clues as to Ms Bachelet’s likely approach to the mandate, and any changes or innovations she may bring to the role. This was especially the case on this occasion, due to rumours that the UN Secretary-General, Antonio Guterres, wants to see a clean break from the approach of Ms Bachelet’s predecessor, Zeid Ra’ad al-Hussein, and that Ms Bachelet was appointed, in large part, with this wish in mind, (a situation extensively analysed in recent articles in Foreign Policy magazine, openGlobalRights, and URG Insights). High Commissioner Bachelet delivered a strong and carefully balanced first speech. While she may lack the oratorical brilliance of High Commissioner Zeid, she nevertheless chartered a careful course between (and yet embracing) the widely different expectations and demands of different UN interest groups, and wisely focused on a number of key issues that will determine the future effectiveness of the international human rights system, and the wider UN. The first part of the High Commissioner’s speech then sought to set out the broad parameters of her strategic approach to her mandate. In particular, she sought to simultaneously allay the concerns, on the one hand, of civil society and some Western States, which are concerned she may choose to avoid, or at least reduce the frequency and volume of, public condemnation of serious human rights violations; and on the other hand, of other States (especially developing countries), which would like the new High Commissioner to forge a more cooperative relationship with States, emphasising dialogue, consensus and quiet diplomacy. The High Commissioner wisely understood that this was a false choice, and thus chose to commit herself to pursuing both goals – in line with the fullness of her mandate as provided by the General Assembly in its resolution 48/141 of 20 December 1993. From this experience, and the wider experience of the brutal human rights violations committed by the regime of General Pinochet in Chile, she fully understands the importance of international condemnation of governments where necessary, and of the power of universal rights to engender and guide change. After reaffirming her commitment to address situations of violations ‘without fear or favour’ and wherever they occur, Ms Bachelet revealed that she would nonetheless be different to High Commissioner Zeid, that she would chart a new course. In particular she explained her belief in working with States, which retain the primary responsibility for the promotion and protection of human rights, in a relationship characterised, where possible, by cooperation, dialogue and consensus. In particular, in order to strengthen the effectiveness of the Council, and of the interconnectedness of the three pillars of the UN, the new High Commissioner urged progress in three interconnected areas: national implementation of international human rights obligations and commitments; the contribution of human rights to the 2030 Agenda and the SDGs; and the UN’s prevention agenda. Strengthened domestic implementation will in turn contribute to both sustainable development and the prevention of violations and crises. Regarding prevention, the new High Commissioner drew attention to the important role of the Council, in cooperation with her Office and other relevant parts of the UN system, in building the human rights resilience of societies (to prevent violations from happening in the first place), and in responding promptly to emerging crises. Featured image: From left to right, Kate Gilmore, United Nations, Deputy High Commissioner for Human Rights, Michael Møller, Director-General of the United Nations Office at Geneva, Michelle Bachelet, United Nations, High Commissioner for Human Rights and Vojislav Šuc, President of the Human Rights Council at a Human Rights Council 39th regular session. 10 september 2018. UN Photo / Jean-Marc Ferré licensed under CC BY-NC-ND 2.0.